Please refer to our stock # TBD00245 when inquiring. 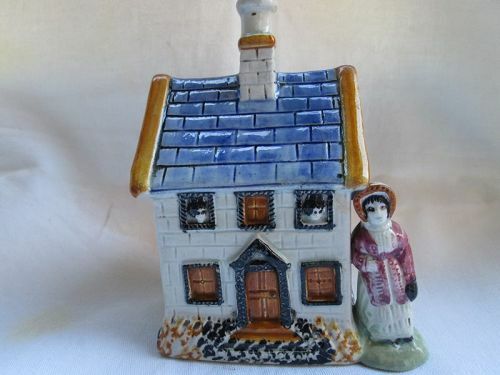 A very nicely painted Pratt Ware cottage decorated with a blue tiled roof, children at the windows with an oversize female standing beside it. On one end of the cottage is a woman with a cornucopia (?) and on the other a flowering tree. At the back in the roof is a slot for large pennies. The colors are well applied. Similar cottages are illustrated in John and Griselda Lewis Pratt Ware, 2006 edition page 249. 5 inches (12.5 cm) tall, 4 inches (10 cm) wide and 2 7/8 inches (7 cm) deep. Condition: An internal crack on the back runs from under the roof to the corner of the house. Otherwise it is in very good condition. Slightly creepy but very arresting.